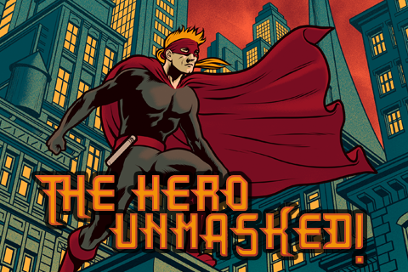 Credits | The Hero Unmasked! Beta Testers: Mouse Bowden, Jocelyn Eccles, Amanda Gaare, Asaliy Joyce, Lysander_Xen, Seth Maron, Vishal Shandilya, Saloni Singla, Inés Souquett, Sage Steffen, Akira Winters. "The Hero Unmasked!" is Copyright 2017 Christopher Huang. All rights reserved. Christopher Huang has been dabbling in interactive fiction for most of his life, with entries in the annual IFcomp and a yearly review in which he compares IFcomp entries to breakfast. He enjoys puzzles, mysteries, branching storylines, and breakfast. "The Hero Unmasked!" is his first ChoiceScript game. He expects his first work of non-interactive fiction, "Murder at the Veterans' Club," to be published sometime in 2018.